Navy blue is an "in" color right now. And the best thing about this trend, is its timelessness. Navy never goes out of style! Navy can be a neutral or a color. You can pair it with neutrals or colors. It can be bright or muted. It's pretty and awesome! 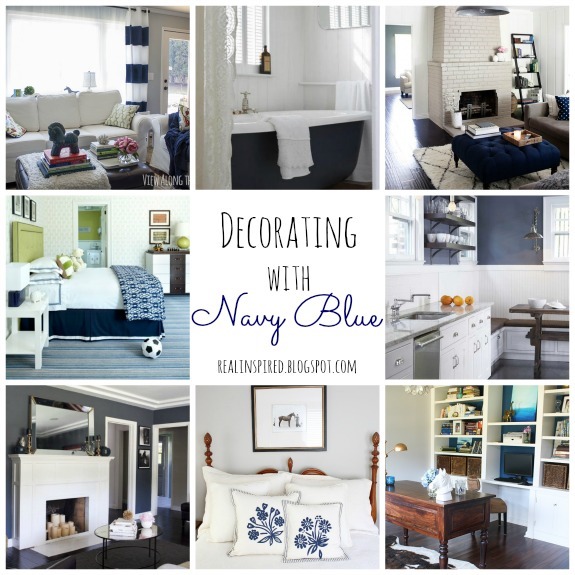 Right now, I'm getting ready to redo the Little Man's room and navy is one of the main colors I'm using. It's gonna be gorgeeeeoooous! It's my new favorite color! Anyways, there are so many great navy color combos out there! 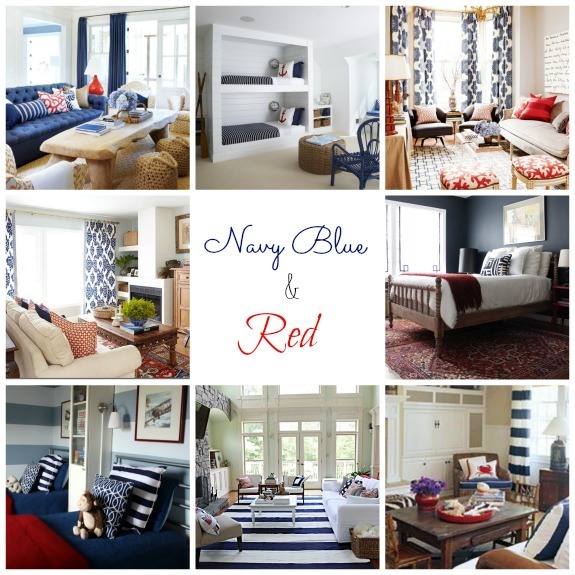 If you've been thinking of using navy in your home, here are some beautiful inspiration photos to get you going. 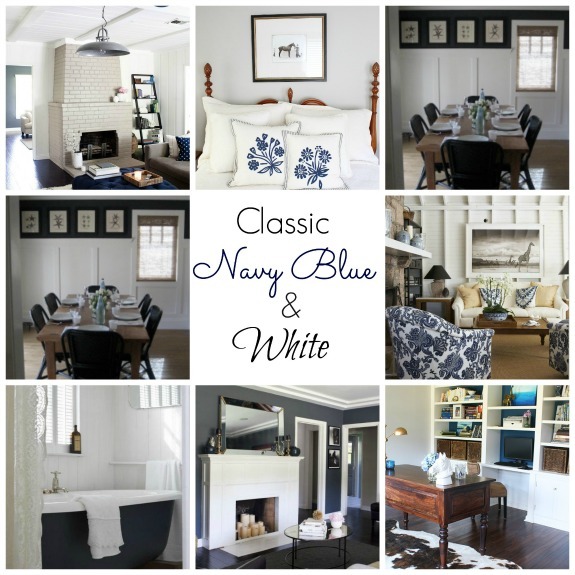 I love the classic navy and white! Everything just pops against it! To keep it from feeling too cool, warm it up with natural fibers, like a cowhide or sisal rug, and layer on the textures with lace, paneling, or baskets. This is my second favorite navy combo. Green will also be in the Little Man's room! I never thought I was a fan of orange, but I am loving these rooms! I think I'll try to bring some pumpkin orange in with pillows come fall. And the coral nursery is so sweet! Red can come off looking too overtly 4th of July-ish when paired with blue(not that it's a bad thing if that's what your going for!) But it can also be playful, moody, or sophisticated. I love that moody navy bedroom with the dark red rug! Yellow isn't my favorite, but it can look so cheerful and bright, or even moody, when paired with navy. I just picked some of the main color combos out there. There are so many variations and different shades to pick from, this post barely scratches the surface! So what are your favorite navy color combos? What color scheme would you absolutely never use? I really like the navy and green!! Just found your blog from The Sunday Bloghop & I look forward to following along! 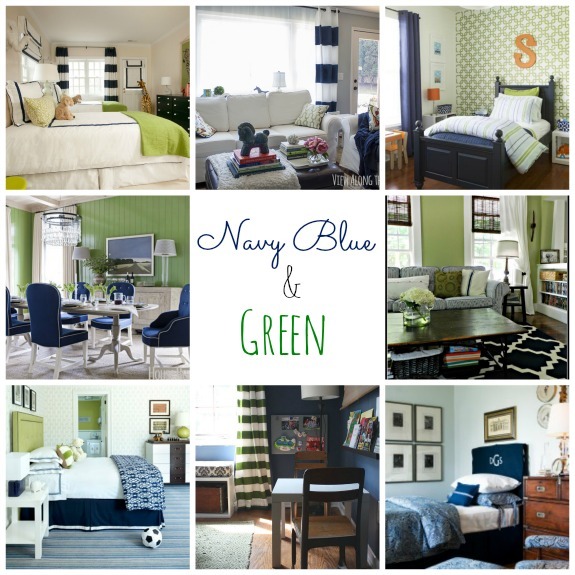 The navy and green is one of my top favorites too! So fresh and cool. Thanks for coming by! Seriously, I wish I had even an once of talent to do these. 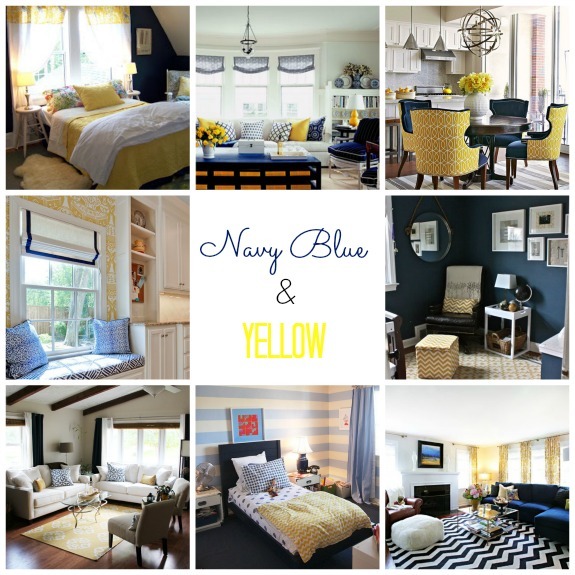 Love the Navy and Yellow! 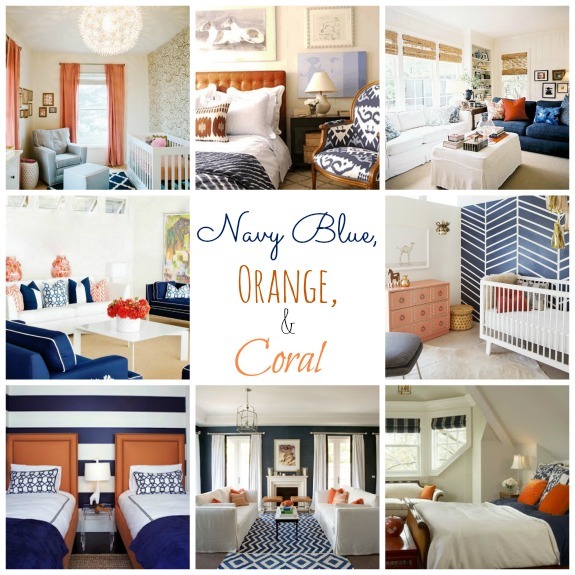 Also liking the navy, orange, and coral! Great inspirations! Excited to have found your blog! I'm following along now thanks to the Blissful and Domestic party! Oh yes, I love the navy and orange especially. Weird because I've never really thought of decorating with orange before. Thanks for following! LOVE this! I have been wanting to redecorate my bedroom with navy blue and I am loving the navy blue and coral...I really like the yellow too though! Pinned! I would LOVE to have you share this over at my link party--this is a great roundup! New follower on facebook! Glad you liked it! And thanks for the invite. I'll be popping over to share and follow along! Featuring these awesome Navy Blue Roundups at tonights link party! I hope you will stop by again!